I was also completely smitten with the FastPass style Save the Dates and Ever After was able to personalize them for me as a scrapbooking embellishment! They are awesome and amazing and look great! So add scrapbooking embellishments to the many wedding printables available at Ever After. Compared to a real Fast Pass (at center) these are awesome! When printed on cardstock they look & feel authentic! Here are my WDW and DL Fastpasses sitting pretty on the first page of my 2011 Disney Scrapbook! Perfection! Oh wait, and there's more (I hope you read that like an informercial because I love this shop so much you could sit me at a table and I could sell it on QVC)! You will also find birthday and christmas card options in the Ever After Printables shop, as well as Baby Showers and Thank You cards! The Disney Park Map Program (if I had found this site before my wedding I would have used this one for sure- its subtle and beautiful)! 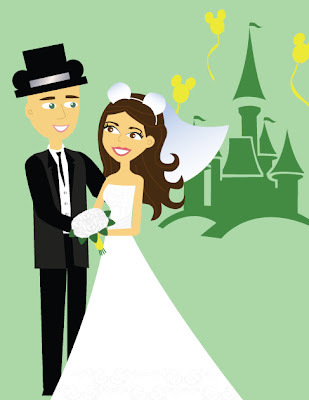 Whether you are planning a wedding or just living a Disney-driven life-- don't miss Ever After Printables! Check out the blog here & Facebook here!